Ideally, you should have one mainstream programming language down very well, to use in interviews. Java is mine. An interrupt is an indication to a thread that it should stop what it is doing and do something else. It&apos;s up to the programmer to decide exactly how a thread responds to an interrupt, but it is very common for the thread to terminate. A thread sends an interrupt by invoking interrupt() on the Thread object for the thread to be interrupted. For the interrupt mechanism to work correctly, the interrupted thread must support its own interruption. The join method allows one thread to wait for the completion of another. If it is a Thread object that is currently executing, then thread.join(); causes the current thread to pause execution until its thread terminates. All threads that are not daemon threads (thread.setDaemon(true); wasn&apos;t called) have died, either by returning from the call to the run method or by throwing an exception that propagates beyond the run method. Memory reference (pointer): 4 Bytes. Object header: a few Bytes (~8 Bytes) for housekeeping info (GC, class, id, etc.). Array header: 12 Bytes (4 Bytes for array length). BitSet – a bit vector with growing size, each element is a boolean with 1-bit size (not 8-bit as regular booleans). 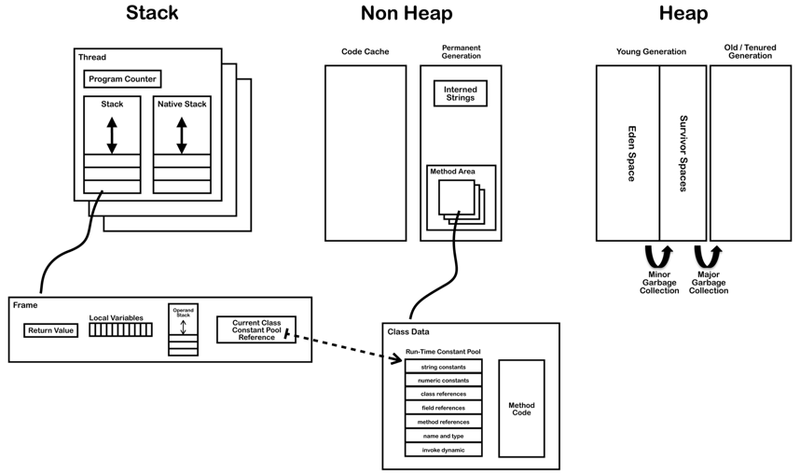 Thread stacks are allocated outside the heap. The heap only stores objects. Thread stacks contain local variables (primitives, heap references) and calls to methods. Sometimes the JVM optimizes and allocates objects that never leave the stack scope on the stack (function-local objects). Arrays are like Objects, and are generally stored on the heap. Default stack size on 64-bit Linux is 256 KB for a single thread. Frame size for a simple method call is 32 Bytes. In JDK8 8 PermGen is replaced with Metaspace, which is very similar. The main difference is that Metaspace can expand at runtime (less java.lang.OutOfMemoryError: PermGen). If you don&apos;t specify MaxMetaspaceSize the Metaspace will dynamically resize depending on the application demand at runtime. Metaspace allocations are out of native memory. 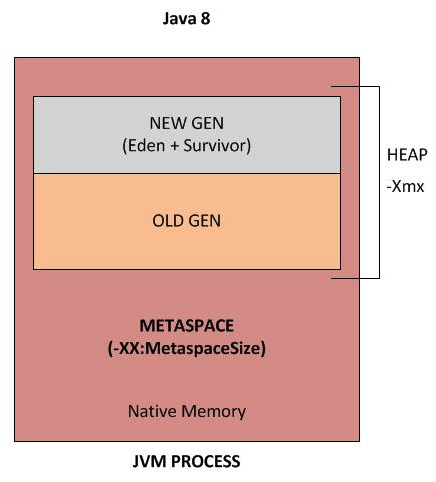 Metaspace garbage collection of dead classes and classloaders is triggered once the class metadata usage reaches the MaxMetaspaceSize option. Since JDK 6 interned strings are no longer allocated in the PermGen, but are instead allocated in the regular heap. Objects are created on the heap. Garbage collection is a mechanism provided by the JVM to reclaim heap space from objects eligible for GC. GC is done by the GC thread. Before removing an object from memory, GC thread invokes the finalize() method of the object, allowing for cleanup operations (but don&apos;t use finalizers – Effective Java 2nd Ed. Item 7). As a developer you can&apos;t force GC, it will only be triggered if the JVM thinks it needs to based on the Java heap size. You can request GC (by Runtime.gc() or System.gc()) but it&apos;s not guaranteed to happen. If the JVM heap is full, and a new object can&apos;t be created, an OutOfMemoryError exception is thrown. An object becomes eligible for GC if it&apos;s not reachable from any live thread of any static reference, meaning if all its references are null. Cyclic dependencies aren&apos;t references, and they will be GCed if no other objects have a reference to any of them. GC scenarios: all references to an object are set to null, object declared in a block and now out of scope, object is a member and the parent is eligible for GC, object in a WeakHashMap. Available garbage collectors and how to select one. Can use java.util.BitSet to work with single bits. Negative integers are stored as the two&apos;s complement of their absolute value. The two&apos;s complement of a positive number is, when using this notation, a negative number. Uses the sign bit (left most bit) to fill the trailing positions after the shift. Shift right while filling zeros 0, irrespective of the sign of the number. int casting drops any decimal, essentially rounding down. Backed by char array, can get it by calling toCharArray(). Strings are always immutable, and the class is final. Strings concatenation with the + operator translates to StringBuilder operations by the compiler, but creates a new instance of StringBuilder for every concatenation. Use StringBuilder directly for repeated concatenation in multiple statements with intermediate strings (single statements are fine, e.g., for String s = a + b + c use StringBuilder). String literals, i.e.String s = "hello", are interned by the compiler. Interned strings are privately maintained in a pool, which is initially empty, by the class String. The public String intern() function on String places that instance in the pool and returns the canonical representation for that string object. When the intern method is invoked, if the pool already contains a string equal to this String object as determined by the equals(Object) method, then the string from the pool is returned. == tests for reference equality (whether they are the same object). .equals() tests for value equality (whether they are logically equal). You almost always want to use .equals(). In the rare situation where you know you&apos;re dealing with interned strings, you can use ==. Java includes an inter-process communication mechanism via the wait(), notify(), and notifyAll() methods. These methods are implemented as final methods in Object, so all classes have them. All three methods can be called only from within a synchronized method. wait() tells the calling thread to give up the monitor and go to sleep until some other thread enters the same monitor and calls notify(). notify() wakes up the first thread that called wait() on the same object. notifyAll() wakes up all the threads that called wait() on the same object. The highest priority thread will run first. You should probably not use wait/notify directly and use the Lock class and others from java.util.concurrent.locks instead. Having no modifier is also called package-private. Autoboxing is the automatic conversion that the Java compiler makes between the primitive types and their corresponding object wrapper classes (e.g., converting an int to an Integer). If the conversion is the other way around (object to primitive) it&apos;s unboxing. Passed as a parameter to a method that expects an object/primitive of the corresponding wrapper/primitive type. Assigned to a variable of the corresponding wrapper/primitive type. The compiler uses valueOf to autobox and intValue to unbox (for int, for example). Beware of unnecessary Object creation with autoboxing/unboxing. Object types don&apos;t support operators (+ for example), so using it on Integer will trigger unboxing and then autoboxing. For arithmetics always prefer primitives. Equality checks with == don&apos;t unbox and so reference are compares, not values. So to compare two Integers use .equals() or preferrable use primitive types. You can get NullPointerExceptions when unboxing.